In today’s fiercely competitive business environment, companies rely on the strength of their brands and the promises they offer. A brand promise encompasses what customers can expect from all interactions with a company, including their emotional experiences. It is expressed through an organization’s people and translated through its products, services, and actions. Brand consultants and strategists look at the brand promise as a critical element in a brand’s credibility. A brand gambles with its integrity in making that promise and in breaking it the integrity is tarnished. Even if the brand has delivered on its promise consistently over time, one broken promise can have a significant impact on trust. According to a Gallup report, a brand promise epitomizes all that a company represents and stands for, it is the unique declaration of what the company offers, what differentiates it from its competitors, and what makes it worthy of consumers’ attention and consideration. 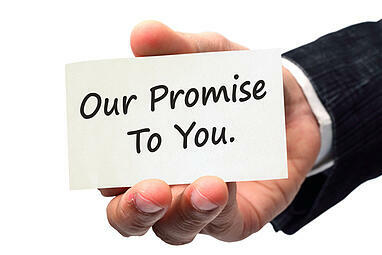 Your promise to customers sets their expectations on the quality of your products or services and gives them a feeling about your brand. This feeling can be very visceral, meaning that when the promise is broken your brand is in for a hostile reaction. The highest-performing, most profitable companies, deliver on their brand promise 75% of the time, according to Gallup. These companies have higher levels of customer engagement, which enables them to surpass their competitors regarding share of wallet, profitability, revenue, and growth. In Gallup's experience, most companies come up empty on their brand promise because they overlook the single most crucial component of the promise -- their people, reporting that only 41% of employees agree they "know what my organization stands for, and what makes our brand different from our competitors." One reason is that many companies have poorly defined brand promises, and in fairness to companies, developing an actionable brand promise is not an easy feat. Brands fail to deliver on their promise for a number of reasons, including evidence that a brand does things that conflict with the external messaging it articulates, and people lash out. And when consumers lash out at a brand today, either as an individual disgruntled customer or as a broader movement, they are armed by social media. In 2017, United Airlines suffered the pinnacle of all social media crises when a video of law enforcement officers dragging a passenger forcibly off one of its planes went viral and was viewed online more than 200 million times. United failed to uphold its brand premise on multiple levels: From the fundamental promise of delivering the service paid for, to providing customer safety, to treating passengers respectfully and delivering on the aspirational promise found in its ‘Fly the friendly skies’ tagline. Trust in the brand promise is a top priority for consumers in determining whether to do business with a company. But trust cannot be assumed or bought–it must be earned through actions. Brand marketers need to rethink their branding strategies to ensure that they deliver on brand promises. Promises that are kept strengthen the brand; broken promises diminish and set the stage for a long and often impossible road back.